Be happy with who you are – the EASY way! Need a way to get back in touch with the real you? To rediscover your own unique talents? This awesome subliminal audio recording will quickly and effortlessly release ALL of your positive attributes and special qualities! 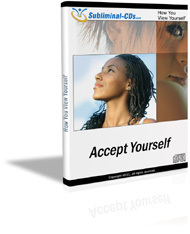 The Accept Yourself session uses the latest technology in subliminal messaging to deliver thousands of positive, potent, powerful messages directly to your subconscious – allowing you to unlock the REAL you within MINUTES! And it’s 100% risk-free! If you’re not completely satisfied with the incredible results, let us know within 90 days and we’ll refund your order in full. Don’t settle for half a life! Purchase Accept Yourself TODAY and enjoy the benefits of this amazing technology straight away!